*All republication rights are reserved by the author. It is hoped that Japanese readers will excuse omission of marks to indicate long vowels. Anyone who has read this Bulletin for the last few years is probably beginning to wonder if I'm writing a continuous serial on travel in Japan. Perhaps enough is enough; this time I'll try to minimize the travelogue part and, quite briefly, tell about the rhododendrons seen in 1970 and the places where they grow. 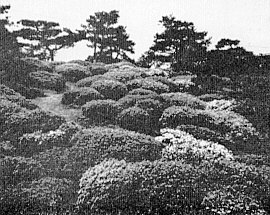 The day after arrival in Japan, Mrs. Doleshy and I flew south to Fukuoka, picked up our Rent-a-Car, and drove to Kurume for a second visit with Mr. M. Kunishige, of the Horticultural Research Station. Mr. Kunishige is an A.R.S. member and one of the world's foremost authorities on azaleas. This time (May 8th) we were able to see the flowers on many of the Azaleas under test, although most would have been better a week or two earlier. Among other things there were hundreds of new Kurume-type azaleas as well as a nearly complete planting of the 300 named Kurumes still in cultivation. Also, there were huge end-to-end rows of Glenn Dale and Hirado Azaleas, and we were impressed by the latter as a high-potential race for southern parts of the U.S. This tour gave us a completely new concept of variation in R. kiusianum , the small-leaved evergreen azalea of Kyushu mountain tops. The form which had been familiar to us, with dense foliage and flower colors from cool violet to vivid rose-purple, was represented by collections from Mt. Kuju, 75 kilometers to the southeast. Nearby were comparatively large, open-branched plants from Mt. Unzen, 65 kilometers to the south. Some of these were evidently from an intermediate zone where the wild plants share the characteristics of R. kiusianum and the larger, low-elevation R. kaempferi , on these specimens the flower colors included pale violet, rich violet, and violet with pink center; assorted soft and vivid pinks; even a reddish maroon. Another planting of R. kiusianum consisted of pink-flowered specimens from Mt. Haneyama, in north-central Kyushu, and Mr. Kunishige suggested that these may be the best yet discovered, since they remain compact even in the warm climate of Kurume. The source location is carefully marked on our large map of Kyushu (gift to us in 1967 from Mr. Kunishige, who is still the only person allowed to write on it), and we'd have gone there this year if our schedule had been as flexible as usual. As for white-flowered R. kiusianum , we saw few, and we learned that these are sought in the field each spring by Research Station people but that a new one is only found once every 2 years or so. We also looked long and hard at the R. kiusianum-kaempferi intermediates from Kirishima (similar to the abovementioned ones from Unzen) as well as another Azalea we were to see in the wild a few days later: the little-known R. sataense from far-southeastern Kyushu. Both the intermediates and the R. sataense have extraordinarily variable, and excellent, flower colors, and it is easy to see why each is thought to have had a role in the development of the Kurume azaleas. Two days later; at Kumamoto Airport, we picked up the Warren E. Bergs, of the Tacoma Chapter, who would be with us for part of the trip. We then headed south to Shiromizutaki, site of our No. 40, 41 and 42 collections of R. metternichii var. metternichii in 1967. A letter from the owner of the inn, written in very legible, easy-to-read Japanese, had told of plans being made for our return visit. This was confirmed the next morning as we walked up the trail to the tiny valley of farms just below the rhododendron ridge: we were accompanied both by the inn owner and the farmer who had been so helpful during our rain-drenched 1967 visit. The wild plants here had been the source of our No. 40 and 41. Revisiting these, we were able to confirm what we had suspected from the seed capsules: Flowers are comparatively large and, on about 15-20% of the plants, have 8 petals instead of the standard 7 (Fig. 18). This is a much higher percentage than reported for a similar discovery of 8-part flowers in Tottori Prefecture. * Flower color is within the usual range, from pale to deep rose-pink, but most flowers were past their best; and we saw few opening buds. *Journal of Japanese Botany, 44:109. 1969. Our farmer friend, as well as others in the little valley, had moved plants down to his garden, and we were particularly interested in the one which had supplied our entire No. 42 collection in 1967. This was still at the peak of blooming and had apparently been selected for its striking combination of deep-pink buds and pale flowers a color scheme similar to that of var. yakushimanum. The seed from this "farmer's plant" had been much in demand from the A.R.S. Seed Exchange, and the owner was delighted when we told him all about this. More so than on our previous visit the indumentum on these plants impressed us as rather thin for south Japanese R. metternichii var. metternichii or, in Japanese, TSUKUSHI-SHAKUNAGE. However, we have noticed at various places that the indumentum tends to be thick in a high-elevation stand of this plant and thin in a low-elevation stand (but practically uniform throughout any one continuous stand - presumably from open pollination). At Shiromizu-taki, the elevation of 950-980 meters (about 3100 feet) is relatively low for R. metternichii in Kyushu, and there is apparently a tug-of-war situation: The regional tendency toward thick indumentum is partially offset by low-elevation shedding of felt. Yet there does not seem to be a parallel loss of hardiness, and we've had good reports from the U.S. East Coast people who are growing seed collected here. Kirishima (literally, "Misty Island") is like America's Yellowstone in that it was one of the first-created of Japan's national parks and is full of spectacular volcanism, with active cones, dormant cones and crater lakes in a chain 20 kilometers long, east and west. As rhododendron country, it is a famous island of high-elevation evergreen azaleas, resting in the broad sea of R. kaempferi which extends over much of Japan. Also, it is one of the stepping-stones of R. keiskei distribution, and it contains beautiful azaleas of the deciduous 3-leaved MITSUBA group, but R. metternichii apparently does not come this far south on mainland Kyushu (i.e., this species apparently stops somewhere in the vicinity of Shiromizu-taki, but then reappears still further south, on offshore Yaku Island, as the famous R. metternichii var. 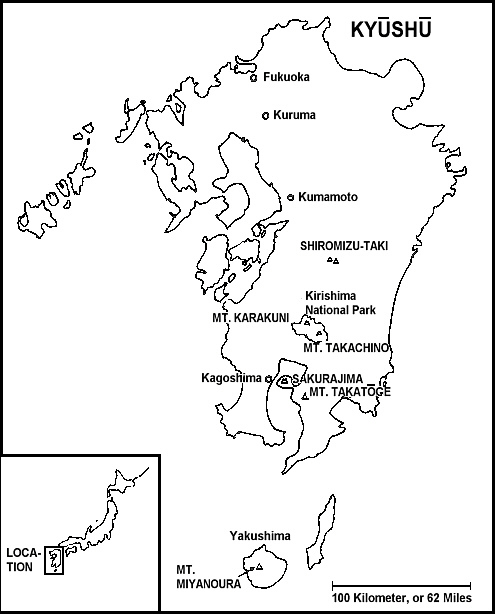 yakushimanum ). This was the 3rd visit to Kirishima for Mrs. Doleshy and me but our 1st in the spring. The rhododendrons would be reason enough to go back. But, for us, an equally compelling reason is historical interest, since this place is related to Japanese culture very much as the birthplace of the great god Zeus is related to Mediterranean and European culture. R. kiusianum often carpets the rocks. R. keiskei was a plant which we had tried to find when last here, therefore it was our first treasure-hunt objective. The people at the inn said that we'd find it just above a main highway on the outer slopes of Mt. Karakuni. This seemed strange, because we had been assured by a famous authority that the species could only be found here on the inner walls of the dormant craters. But we looked above the highway and found a stand of R. keiskei which, on at least 1 acre, filled practically every gap and niche between the rough blocks of lava, commonly about the size of a large chair. 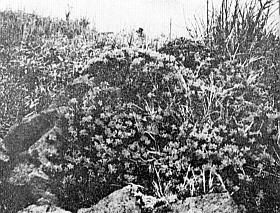 The plants grew only to the height necessary to bring them even with surrounding rock surfaces, or a little higher, and these plants cushions were covered with flowers, i.e., leaves were often practically hidden. Color varied from pale yellow to butter yellow and was on the golden rather than the greenish side. Previous autumn's seed remained on enough plants to make some picking worthwhile, and we have since sent a small quantity (as our No. 202) to each central and eastern A.R.S. Chapter, beginning with Midwest and Southern. For us, this has germinated fairly well, and we wish luck to all others. R. keiskei apparently extends much beyond this acre of concentration. And, growing with it in most places were small plants of Ilex and the MITSUBA Azalea (probably R. nudipes ), badly smashed by each year's ice and typhoons but with enough recovery for survival. Also interspersed everywhere was R. kiusianum , just coming into bloom. This was not at all smashed, since it is expert at creeping prone on the rock surfaces or, in a little more shelter, forming a football-size plant which is almost as firm as a rock. Several had flowers of the pale, cool lavenders often seen at the higher elevations (here, 1260 meters, or 4130 feet). One, however, on a south-tilted tabletop of rock, had numerous flowers of vivid purple-rose. We found no seed, but did not make any special effort because of wide distribution of our 1965 and 1967 collections from the same mountain or nearby. The next order of business was to see the famous R. kiusianum-kaempferi intermediates, of which we'd had a foretaste at Kurume. Mr. Kunishige had given us detailed directions: Drive east to the foot of Mt. Takachiho then turn south onto a gravel road leading down to the Kirishima Shrine. On the way over to the mountain we stopped at a viewpoint which had been impossible to forget since our first visit, by bus, in 1965. This year we made up for previous picture-taking deficiencies and then walked across the road to look at a small area of rough meadow. Among the grass was a surprising tangle of R. kiusianum , in bloom at this somewhat lower elevation of 1000 meters. The flowers were mostly an attractive, soft pink. and several plants' leaves were almost kaempferi-like - the first hint of the great transition ahead. After another kilometer or two we took the downhill turn and immediately started seeing large-leaved azaleas 1 meter or more tall. For about 5 kilometers. until we entered heavy coniferous forest on nearly flat land below, we were probably never out of sight of the azaleas. The transition toward R. kaempferi continued, first with a change from delicate rose-pink flowers to more vivid and varied pinks. Then the plants became increasingly diverse, and the climax of the transition was in meadows and woods at about 800 meters elevation, with an explosion of colors. Side-by-side plants had flowers from deep purple to orange-red. with kaempferi -type foliage on some (usually but not always the orange-reds), and more or less enlarged kiusianum -type foliage on others. Mature plants in the meadows were uniformly about 1.4-1.5 meters tall. but those in adjacent woods grew considerably taller. As we drove lower there was a rapid change to the appearance of straight R. kaempferi , and most plants below 750 meters would be so accepted. Dr. John Creech and others have considered this group of plants a hybrid swarm-perhaps the complete explanation. 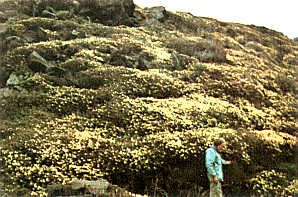 However, I think that another possibility should be considered, i.e., that the mountain plant populations receive a constant stream of replenishment from the great pool of R. kaempferi at lower elevations, via seed or pollen, and that these uphill migrants undergo genetic screenings as they climb, thus losing all but the characteristics seen at higher elevations. Major source of the Kurume azaleas? Our next lodging place was at the shore of Sakurajima Volcano, which juts out into the bay between the 2 southern peninsulas of Kyushu. While here, our main trip was to Mt. Takatoge, in the Takakuma Range, to see R. sataense (SATA-TSUTSUJI). Under its own name, this is one of the least known rhododendrons of the world. However, several observers believe that these wild plants are the source from which some or many of the Kurume azaleas were selected. Therefore, under this guise, R. sataense may actually be one of the most widely grown plants in the world. example of the immense range of color. Mr. Kunishige had phoned down from Kurume to make sure we'd get on-the-spot directions from the nearby field station of Kagoshima University, and a faculty member climbed with us to the 722 meter summit of Mt. Takatoge. Going up the south side, we were disappointed; many of the azaleas had finished blooming but the withered flowers hadn't dropped off yet. However, on the plateau to the northwest, at about 675 meters, we were far from disappointed. Most flowers were still in good condition, and almost every color to be seen in the Kurume azaleas (except white) was represented here: pale, delicate pink, deep salmon-pink, pink with maroon center, watermelon red, purple, and so on, with no two exactly alike. These well-shaped flowers produced in quantity, in some cases so thickly that they formed a large, truss-like head at the end of the branch. Mr. Kunishige had told us that they inhabit a narrow band of elevations, perhaps 650-750 or 650-800 meters above sea level. Yet, within this band, they seemed not at all particular about exposure or site. In an area which may once have been cultivated they had moved in onto low flats and steep earth walls. Also, in a reforested area, it appeared that the azaleas had been cut out to give the young trees a chance, but had grown back from the roots and produced dense, flower-covered plants to chest height or above. Yet, in relatively undisturbed forest at the edge, they were happy and free-blooming in partial shade. As in the case of R. keiskei , previous autumn's seed could be found, and we distributed most of ours, as No. 205, to the central and eastern chapters. For us, it has germinated well, and we trust that this has been the general experiences. Creech, J. L., Ornamental Plant Explorations-Japan, 1961, Amer. Rhod. Soc. Bulletin, 21: 2-9. 1967. Hara, H., Occurrence and Distribution of Rhododendrons in Japan, Royal Horticultural Society Rhododendron Year Book, 3: 112127. 1948. Kumaza, S., Kurume Azalea. 25 pp., illus., 1958. 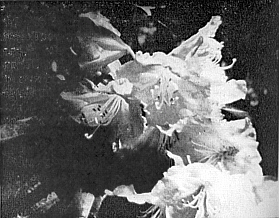 Photo-reproduced; distributed by Kurume Branch, Horticultural Research Station, Miimachi, Kurume, Japan. Nitzelius, T., Notes on Some Japanese Species of the Genus Rhododendron, Acta Horti Gotoburgensis, 24: 135-174. 1961. Ohwi, J., Flora of Japan (in English). 1067 pp., some illus., Washington, D.C., Smithsonian Institution, 1965. Serbin, A. F., R. Yakushimanum and its Home, Yaku Shima, Amer. Rhod. Soc. Bulletin, 14: 9-15. 1960. Wada, K., Rhododendron reticulatum and its Relatives, Royal Horticultural Society Rhododendron and Camellia Year Book, 19: 93-95. 1965. 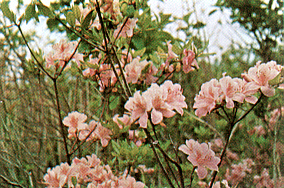 Yamazaki, T., A new variety of iRhododendron metternichi and its alliance, Jour. Japan. Bot.. 39: 13-18. 1964.